Up until now, Noelle had one great love, someone who because of circumstances too obtuse to explain here and now, ended up spending many years right next to her yet out of reach. "Goodbye My Almost Lover" captures how she felt during the last years of his life. "Pennies From Heaven", the Depression classic is a song that Noelle sometimes sings to herself to help her cope with all that has gone horribly horribly wrong. And in her mind's theatre, it is the rich and pain-knowing voice of Billie Holiday that echoes the lyrics of this song. "Who Wants to Live Forever" by Queen is one of those songs that crept into Noelle's heart, mostly during the lonely decades before EOTL begins--when, in the wake of tragedies both sudden and grinding, she set off to be on her own, a hermit amid one crowded city after another. One you consider it, the reason should be pretty obvious. I'm not sure if Noelle has ever seen the musical Wicked, but if she did the song "For Good" would resonate with her regarding her relationship to Cecily, her very best and very worst friend. Although she doesn't realize it as the story begins, "What Would Happen If We Kissed?" really captures how Noelle finds herself feeling about Roy. It is a startling development to her--a woman who chose loneliness, who prefers to keep others at a distance (or so she tells herself). I am a Guest Blogger, Part Deux! A post near and dear to my heart for Vampires.com--about Joseph Sheridan LeFau's Carmilla. 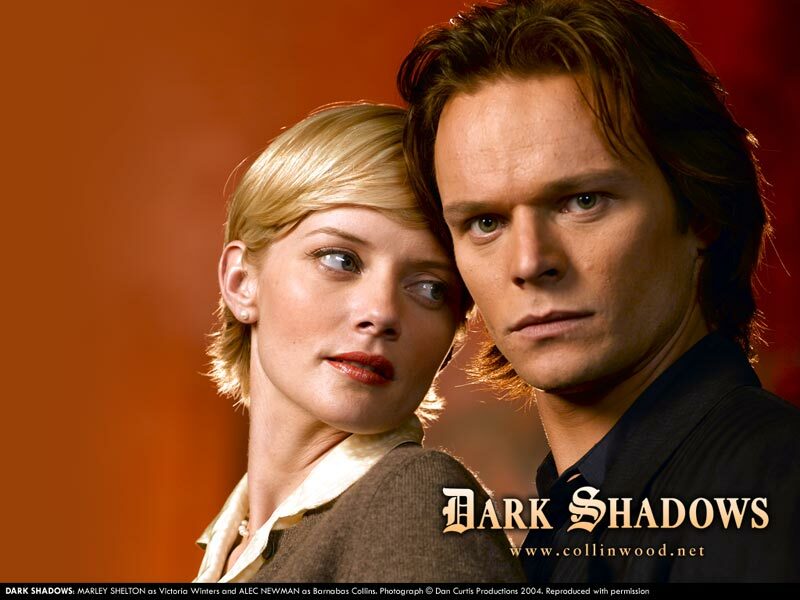 Well, I finally saw it--the unfinished pilot for a re-invention of Dark Shadows back in 2004. The WB pulled the plug before director P.J. Hogan completed it. Right now Tim Burton and Johnny Depp are planning on doing a major motion picture version. Honestly, I'd heard lots of disparaging things about it. Among those who seemed to dislike this pilot intensely was the man who introduced it! He was something of a personal assistant to Dan Curtis, the original creator of the series. One thing mentioned over and over again was "not Dan's vision." When it came to details, one complaint was that actress Marley Shelton, who played Victoria Winters was "allowed" (yes, that was the word he used) to have blond hair. Just for the record--I don't give a damn about Dan Curtis' vision. My judgment is based on what ended up on screen, the story told and the characters whose lives I'm supposed to care about. Curtis got to tell his version undiluted in the motion picture House of Dark Shadows. It was fun. It also lacked nearly every single element that made me care about the show in the first place. And multiple reports from those involved say how much Curtis opposed the whole idea of making Barnabas the vampire sympathetic at all. The pilot was shown as part of the 2010 Dark Shadows Festival in Burbank this last weekend. 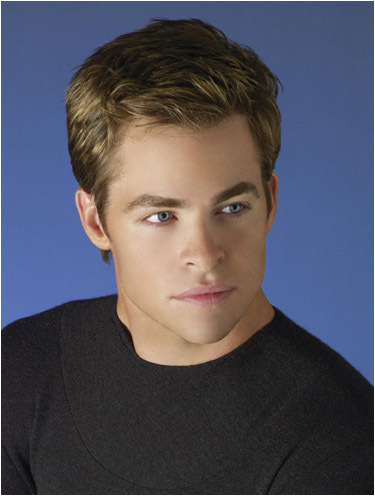 Amongst fans of the original show many the cutting criticism has been aimed at the 2004 pilot. I liked it. Upon stating this to people after the event, I got some nods and a few incredulous looks. Listening to them, patterns emerged. One was intense dislike that a particular character seemed more physically attractive. Likewise another was less poised, less imperious. Both in terms of the pilot were minor characters given little development at that point. Methinks the former personal assistant (who also seems involved with the Curtis estate and is certainly pivotal in the DS Festivals) revealed much when he make disappointed/puzzled noises about the actress who played Carolyn--both in this and in the 1991 revival. He found their performances "odd." I found them both very good--genuinely rebellious young women with wild sides. Overall, methinks the 2004 pilot worked as a startling re-imagining of the story, supported by a top-knotch cast. Although incomplete (whole scenes were never finished, many special effects were unfinished, etc.) one could see the "shape" of the work. I rather understand why the plug was pulled--mostly a matter of style, at least IMHO. It "felt" more like a film than a t.v. show. Light for example was highly stylized, in a manner I suspect would be extremely difficult to sustain for 22 hour-long episodes. There was also an unrelenting tone of mystery, suspense, danger, etc. Again, hard to sustain. Even more importantly the story was almost unrelenting in its lack of humor or kindness. Really, the only hint of such was in Vicki's slight interaction with David and with Carolyn's scene with Joe. Among other things, this robs the more dramatic moments of some power by making them fail to stand out. Keep in mind this would also be my criticism of the motion picture House of Dark Shadows. In the 1991 version, for example, some touching scenes involving Willie Loomis popped up almost every other episode. One reason I still prefer Frid's Barnabas over Ben Cross is that the former smiled and seemed to mean it. Now to the good. A lot of plot holes from previous versions seemed closed. How for example did Willie not end up drained to the last drop by the no-doubt ravenous Barnabas? In this version, Willie has a girlfriend/accomplice who slakes the vampire's thirst. Julia Hoffman seems to take over the role given to Dave Woodard before now--a respected local doctor. Much more logical, and the glimpse we got of her conveyed a sharp intelligence coupled with a fascination over these strange attacks in Collinsport. David really does come across as a disturbed little boy, and Vicki as someone qualified to deal with him (which helps explain the equivalent of a governess in this day and age). Performances seem excellent throughout, but most especially Carolyn (Jessica Chastain) and Roger (Martin Donovan), the latter coming across as someone with genuine complex reasons for his rather appalling behavior. Alexander Gould as David Collins also did extremely well. Barnabas, Vicki, Elizabeth and others did well but those three really shined. Matt Czuchry as Willie Loomis was more almost-funny than real, and frankly seemed to be mugging. Like virtually all versions of Dark Shadows, this one feels rushed. Perhaps due to unfilmed scenes, the whole arrival of Barnabas and his taking over the Old House takes much too little screen time. Again, Vicki Winters is made the double (and presumed reincarnation) of Josette--a decision I disliked in 1991 and now. In the original show, Josette is a ghost. Barnabas, mentally disturbed to say the least, is engaged in an emotional tug of war between turning Josette look-alike Maggie Evans into a brainwashed copy of his lost beloved, or pursuing the love of someone here-and-now. The conflict between his past and his future was to me a very powerful one and while I understand the urge to simplify the tale, I miss the resonances. Angelique appears as a kind of evil ghost in the 2004 pilot, with the mild hint that she has become active again now that Barnabas is free--but we didn't really get to explore that idea in the pilot. I like that there was no effort anywhere to get actors who resembled the cast from the 1960s. Vicki Winters is blond, not brunette. Carolyn is a redhead, not blond. Ditto Angelique. Roger looks like a forceful, withdrawn man rather than the sarcastic dilletante we all knew back in the day. And so on. Overall I was left even more frustrated that the series never made it to the air. What I saw intrigued me and left me wanting more. Methinks it might well have accomplished what any such remake so needs to do--draw in new fans, new viewers (in the manner of the re-imagined Battlestar Galactica--and with approximately as much howling from the die hard old fans). For some time now David Suchet has been playing Agatha Christie's most famous (and eccentric) detective, Hercule Poirot. Along the way he has actually revisited several tales that had been filmed previously--The ABC Murders (in which Tony Randall played the great detective) as well as Evil Under the Sun and Death on the Nile (starring Peter Ustinov). 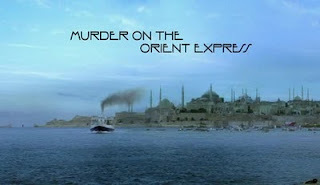 Now a new version of what is arguably Dame Agatha's most famous mystery--Murder on the Orient Express. No small feat, given the reputation of the star-studded first version, with such luminaries as Albert Finney, Lauren Becall, Ingrid Bergman and John Gielgud. This version, like many of the current versions, takes a different direction than previous ones. One trope common to most Christie adaptations is shredded away almost instantly. Like a real train, this Orient Express is in fact crowded. Trapped in a snow drift, they lose power and passengers are soon huddling together for warmth, visible only by candlelight. The comfort of these drawing room murder mysteries is gone--bringing into sharp relief the emotional turmoil inherent in the tale. Not merely for witnesses, but for Poirot himself! Of course the basis story is essentially present. The Calais coach en route to Paris from Istanbul is surprisingly full for winter. At the last moment the director of the train line insists upon finding Poirot a berth. Passengers include a Russian Princess and her maid, a Missionary, a British Army Officer, a Hungarian noble couple, a physician, a car salesman, etc. 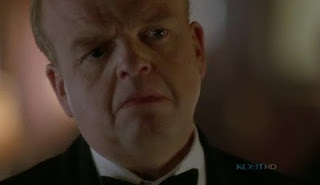 One passenger, the unpleasant Mr. Ratchet (Toby Jones--you might know him as the Dream Lord from Doctor Who) wants to hire Poirot as protection--against what specifically he refuses to say. 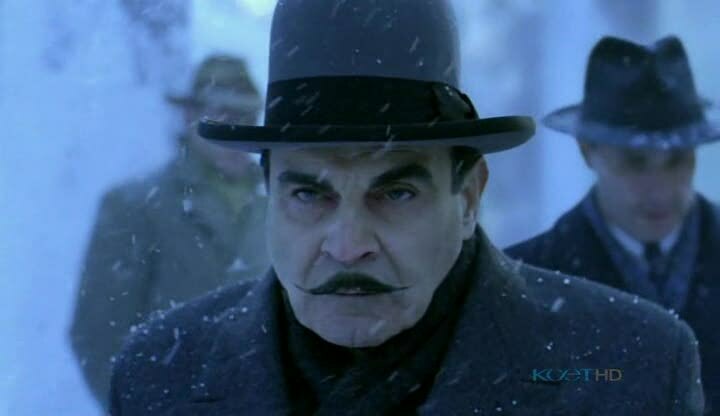 Poirot refuses and within a day Ratchet is discovered dead, stabbed to death in the middle of the night. Meanwhile, the train has hit a snow drift trapping and the passengers for at least a day or two. Poirot, at the director's insistence, investigates--and comes across one of the most startling solutions in his career. Much centers around the true identity of the victim--a vicious criminal named Cassetti, responsible for the kidnapping and murder of Daisy Armstrong five years earlier. This crime set off an avalanche of tragedy. The mother miscarried and died upon news of her child's corpse being found. The father, a war hero, killed himself--as did a French maid who fell under suspicion but was later proven totally innocent. What fascinates is how this version really plays up the moral ambiguity. Nowhere more in the short-lived relationship between Poirot and the person who proves his true antagonist--Miss Debanham (Vanessa Redgrave in the 1974 film, now played by Jessica Chastain). Before the train departs, Poirot and she are both witness to a terrible sight--a man leading a crowd to chase down, then stone to death his wife whom he claims to having been unfaithful. Poirot, having just left a case wherein a man committed suicide after having been proven a liar (he panicked when someone he knew was killed in an accident) agrees this was "unpleasant" but also "she knew the rules." Miss Debanham sees further, that even if guilty that poor woman killed no one. How could that have been justice? Later in the story Poirot also meets Greta Ohlsson, who is his own morality taken to extremes. Slightly unstable, clearly traumatized, she proclaims Catholic doctrine wrong with its redemption and forgiveness--there are some crimes, she insists, God CANNOT forgive. And top of the list she puts violence against children. Poirot's own Catholicism is on display in this film. Interestingly, he prays at the same time as does the victim. The Detective utters some homilies which seem sincere, while Ratchet/Cassetti almost weeps--but with more fear than contrition. Or so it seems. Almost everyone reading this realizes who killed Cassetti. Everyone did it--all but Poirot himself and the director of the train line. Friends, relatives, loyal members of the Armstrong household--each had resolved to hunt down the man who murdered a child and destroyed so many lives. The gentle-seeming Governess, Miss Dabenham, is the ringleader--and her motivation, like the others', is so clearly an attempt to ease the horrible pain of an evil that shredded their lives. She herself was left with a useless right arm (from being bludgeoned the night of the kidnapping). Yet even this, a kind of vigilate's fantasy, is not so clear-cut. Princess Dragomiroff, beloved godmother to the late Mrs. Armstrong, recounts the murder in a way that both excites and chills. In this version, Cassetti was conscious for his murder--and the Princess' words "You will soon be in Hell...did you think we would not hunt you...?" were the last he ever heard. The conflict treaded upon so carefully in the 1974 motion picture presents itself here as far more raw. Poirot does not wish to let these people get away with it. He makes an impassioned case. Without law, he says, we are barbarians. When the law and justice fail, that is the time to raise them even higher--not abandon them in the name of vengeance! 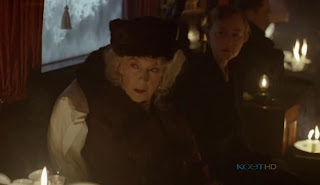 Colonel Abuthnot (Sean Connery in 1974, David Morrissey now) actually draws his gun to insure keeping the secret, until Mary Debanham (whom he loves) virtually throws herself on the gun to stop him. Likewise, the others will not hear of it. They executed a guilty man. They will not slaughter someone else to keep a secret. Bad enough to have to live with committing one murder, however justified! In the most famous film of this story, Poirot is troubled enough to let someone else make the decision. But in this version, allowing anyone else to do that is unthinkable. He will either tell the authorities the truth, or go along with the lie--and that he even considers the latter hits him like an earthquake. The straightforward, even ruthless man who begins this journey to Paris is not quite the same person who emerges from Orient Express a few days later. And he knows it. We can see it in his haunted eyes. Just as we can see her knowledge that they have done this to him in the gaze of Miss Debanham. A dear friend of mine did something lovely for me. She got free passes to a test screening of the film Let Me In a week or so back. This is a flick I look forward to with fervor. She drove us both over twenty miles to the mall, arriving early, but then when we finally reached the front of the line we were told our demographics were filled. We couldn't come in. But they did give us passes to see a free film at that multiplex that night. 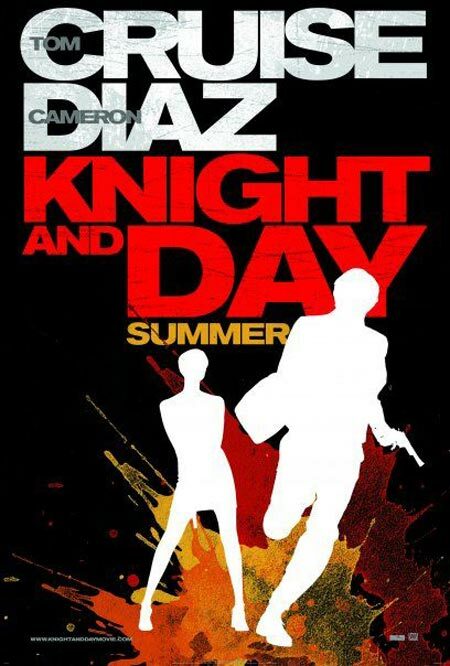 Ultimately we chose to see Knight and Day. For those of you who don't know, this is Tom Cruise's latest action flick and it co-stars Cameron Diaz with folks like Peter Saarsgard in supporting roles. Less than ten minutes into the film I turned to my friend and said "Three Days of the Condor as a romantic comedy." Such was my first impression and pretty much remained the case throughout. In truth the whole flick is quite charming, if you're in the mood for something like it. Mind you, I'm awfully glad not to have forked over ten bucks to see it. Plus it never really pushes its quality over into something really compelling. In theatre one often reads or hears comments about the "well-made play" which is a nicely crafted plot according to some well-proven tricks of the trade. Well, Knight and Day is the cinematic equivalent. No real surprises. No risks taken. Complexity eschewed in favor of a smooth story, as opposed to a fascinating one. Well-done character quirks instead of character depth. What one ultimately gets is not a hearty meal but a pleasing h'ors deurve. And I'm still trying to figure out the title. "Knight" makes sense well enough, for at least three reasons I can see. But "Day"???? Diaz means "day." Plus there is a cute (even slightly evocative) line about the word "someday" at the start and end of the film. But it is still a poor title that had me scratching my head. Check in out: Let Me In Vs Let The Right One In. Anyway. 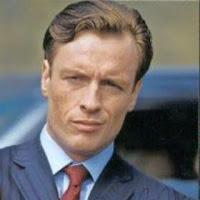 One face that immediately springs to mind is that of Toby Stephens, son of two very distinguished British actors and with a quite a respectable career in his own right. 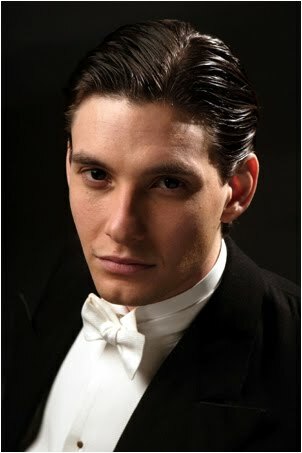 For example, he got to play Rochester in Jane Eyre as well as Bond villain (how cool is that!?). But the part might just as easily be taken by Ben Barnes (of Prince Caspian and Dorian Grey fame) or Chris Pine (these days best known as the latest incarnation of Captain James T. Kirk). "Mr. Branzer?" The chair made little sound as it slid across the carpet. Johnston rose as he moved that chair, precisely as he'd practiced time after time. Clients didn't want to see an attorney with human flaws. They paid for competence sublime and unflappable. Johnston prided himself on just such competence. He practiced. "Yes," said the man stepping inside the office. Johnston judged him to be thirty at first glance, then mentally added ten years a second or two later. Something about those eyes. "I am sorry to be late." He was supposed to have been here three minutes ago. Germans and their punctuality. "No worries," Johnston waved away that concern. "Please sit." "Thank you." Marko Branzer didn't so much sit in the leather armchair offered as he claimed it. Johnston felt a stab of envy at his client's grace, and the way he managed to wear what was after all a rather old if elegant suit. To Johnston's practiced eye, a few telltale signs of wear had begun to show. One cuff frayed in the tiniest way. A brass button barely more loose than its fellows in the charcoal gray vest. A tie slightly faded. Shoes ever so slightly more scuffed than one might expect. Each detail possibly meaningless alone, but combined forming a specific message. Here was a man descended from what he had been. The suit was Saville Row, but not recent. A shirt good, but not the best. Yet here was a man who clearly was used to the best. That he was going without gave Johnston a mild pleasure. "I am pleased to announce we've had success with out inquiries, Mr. Branzer." "And by success you mean--?" "The title to which you referred in your letters, that title is indeed vacant and therefore you may with reasonable certainty petition to claim it for yourself." Johnston did not see the reaction he expected. In his experience, the distant relatives of noble families enjoyed the prospect of a title, of being able to call themselves The Right Honorable or His Excellency. A smile was common, often subtle but sometimes quite obvious and delighted. Some changed their posture, drawing themselves up as if they'd earned some kind of prestige by what was in truth just an accident of history. Not this one. Mr. Marko Branzer just stared at Johnston, stared without blinking until the attorney almost cleared his throat. "If I may expound," he began, "the Von Alphsteins proper were of course reduced in the wake of the First World War. Three sons and two daughters died before it was over. Casualties on the front or victims of the Influenza. I don't know if you were aware, Mr. Branzer, but the autumn of 1918 saw one of the greatest health disasters in human history." "The Spanish Flu," replied the man in front of him. "I am very familiar with it. Across the globe millions died, more than in the Great War to that date, and in a mere handful of weeks." He spoke low and looked away at the end. "As it happens," said Johnston, "the Baron's oldest son and youngest daughter both perished." "But the Baron himself survived? Or not?" "For a time. He suffered a stroke and his middle daughter Greta cared for him until 1924." At the mention of the daughter's name, Branzer turned again to stare at Johnston. "She was your great grandmother I believe?" "My grandfather and she were close." "Quite so, quite so. I would hope they remained in correspondence, at least for a time?" "Not as long as either of them would have wished, Mr. Johnston. But--what became of her?" Johnston made himself sigh and rearranged his features in a mask of professional compassion.That mask had been the work of years and he was proud of it, taking a genuine pleasure in seeing its impact. "She had lost so much, you see," said Johnston, "and I fear she did not get along well with the remaining son of her own generation, the new Baron." "That was his name, yes." "He was a swine." Branzer's voice did not rise above a whisper, and every word dripped venom. Johnston did a take. "Your knowledge," he said after a moment, "of their personal relationships--gleamed no doubt from your grandfather, I presume--cannot help but be more accurate than my own." Johnston now feared the worst. Some people got lost in the past, took everything personally, feeling the passions of strangers as if they had anything to do with the here and now. Adjusting his mask accordingly, Johnston did his best empathic nod while quietly adding another ten percent to the bill. "I'm sorry to say she died in 1925." Johnston inwardly braced himself for unpleasantness. "The local coroner ruled it a suicide." His reading conveyed just enough doubt to hopefully give an injection of comfort. "I don't believe that." This Branzer spoke without rancor, almost not even addressing Johnston at all. Typical of the type. Egocentric to the bone. "We have copies of the official report, should you wish to peruse them." "No need. No purpose at this point." Branze now moved with a speed that astonished Johnston. He produced a cigarette case from the interior pocket of his not-quite-the-best coat, and a matching lighter. A tiny dark cigarette appeared as if by magic on Branzer's lips. Johnston noticed this in the exact instant the cigarette became lit. Then case and lighter disappeared. It seemed to have taken a tenth of second. No more. Perhaps less. "Knowing Uncle Alois as I did," said Branzer in a low voice, "whether he put the pistol in her hand or held it himself--the difference was no more than academic." He took a long drag on the cigarette. "What date?" "Upon what date did my--did Greta von Alphstein die?" "She...she shot herself--you were quite correct about the method--on the twenty first of June." True or not, Johnston found that detail distasteful. "How extraordinary." He managed to keep a neutral tone. "Not so much, either way." Branzer took another deep drag, allowing the smoke to wreathe about him. The effect was startling, mesmerizing, and to Johnston ratehr common. "And dear Uncle Alois? What did fate have in store for him? Had he married?" "Twice actually, both times to young women of good family and considerable fortune." "As it turned out, no." "No, there wouldn't be." An old hate shone in Branzer's eyes, a hate born from pain. Johnston was experienced enough to recognize the signs, and feel put upon by having to experience it even second hand. Third hand in this case. "How soon did each of them die?" "'The first died soon after the first World War. The second shortly before the Second." "But I might as well admit, Mr. Branzer, that Baron Alois von Alphstein came under suspicion for his second wife's death. There were evidently police inquiries following complaints from her family." "Mr. Johnston--are you about to tell me justice was indeed done?" "That perhaps is beyond the scope of my knowledge, sir. I can tell you the investigations were ongoing when the Baron met with an accident. His automobile slipped on a patch of ice one night and spun out of control. He suffered numerous broken limbs as well as other injuries." "Did he die of them?" The handsome client took another long drag on his cigarette. Closed both eyes as he did so. "Do you have family, Mr. Johnston?" he asked after an eternal several seconds. "One hopes you and they are somewhat strangers to each other." Johnston blinked, absorbing his client's words. Several responses immediately came to mind. His genuine reaction--startled distaste as such a baffling and boorish comment--did not. Honestly was rarely the wisest answer, in his experience. "Oh?" he finally said. "Intimacy carries its own horrors, you see. Expectations coupled with the most intense of judgments, choices limited by a thousand thousand demands until answering them becomes habit. I've often considered how a relationship resembles a horse and its rider. The parent, like a jockey, squats upon the child's back and gives directions. Words and actions are like reins. All the power that an adult has over a child functions essentially as does a bit. Family traditions like blinders over the eyes. Pity the vast majority, Mr. Johnston, who never throw their rider off, who don't manage to jump the fence. It isn't easy. The rider, after all, has a crop. And even the best of them use it." Suddenly, Marko Branzer stopped. He lifted one hand to his cheek, a look of astonishment on his face. His eyes opened and stared at his fingers as they came away. Oh dear God. The man was crying. Johnston looked around him, seeing if a box of kleenex or something might be nearby. His clients weren't usually so emotional. Finally, he remembered some were in his least-used drawer, the bottom left. He opened it, reached in and took out an unopened box of tissues. Soon, his fingers had removed the top. He turned to his client. The chair was empty. The door finished closing. In the air a trace of scented tobacco lingered. Don't know if I succeeded or not. Perhaps you'll let me know? 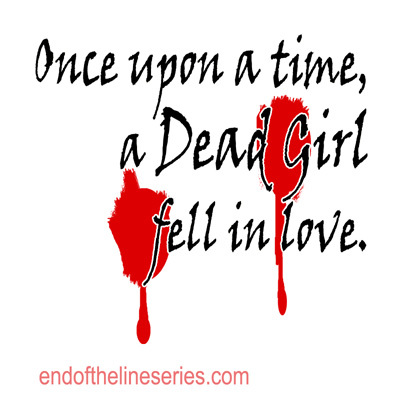 End of the Line is a project a friend of mine and I are working on together. It will be a web series, initially composed of twelve ten-minute episodes to be available on YouTube (among other places). What is it about, you may ask? Imagine, if you will, Dexter Meets Twilight. That'll give you some idea. Or if you want more.. "Girl vampire with a young soul meets Boy human with a very old one. Together they try and solve his father's murder." It is set in a fictional city called Alexander Bay somewhere in northern California. The two met on the mass transit train system, since they both live in a former fishing village at the outskirts of the city, called the Isle of Cats. One of the train lines finishes there, hence the title. But the title means a lot more than that. For example, our hero is the last of his father's children--the end of his father's line. 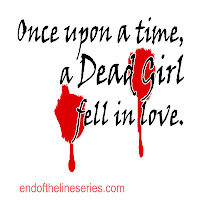 Just as our heroine is the last vampire created by a certain other vampire--she being the end of that line. Emotionally, both are at the end of where they have been and must begin something new or stagnate. And so on. If you're a regular reader of this blog you've even met them. A few months back our vampire talked with me in the posted dubbed "Meeting Noelle." A little later was the post "Meeting Roy." Such are their names. Noelle and Roy. For the record, each is something of a pun. Noelle's is the more obvious, but you probably don't have a chance of figuring out the pun with his name until I tell you the rest of it. Roy Istvan. Maybe that'll help. Be warned--it is pretty obscure. Noelle and Roy. Frankly we hope this pair will go down with Edward and Bella, Barnabas and Josette, Nick and Natalie, Buffy and Angel, Bill and Sookie. I'll keep you posted as things go along. Lots of things to share, like a map of Alexander Bay. And news about the graphic novel (we seem to have found an artist). There's to be a reading of the first few scripts later this month. Plus the website, the Twitter account, the YouTube Channel and Facebook pages, etc. Have you noticed one especially different about this so far? Yep--the girl is the vampire in this one.